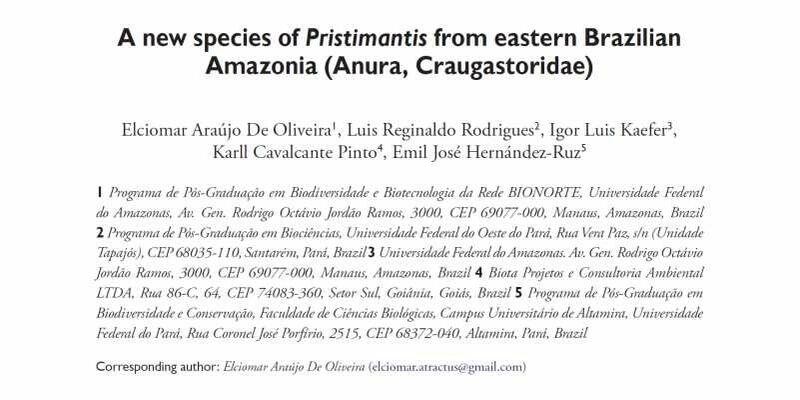 In this study a new species of Pristimantis (Anura: Craugastoridae) of the P. conspicillatus species group is described. Pristimantis latro sp. n. is known only from the municipalities of Altamira, Anapu, Brasil Novo, Medicilândia, Uruará and Aveiro (Flona Tapajós, right bank of Tapajós river), in Pará state, Brazil. Morphologically, the new species distinguishes from known congeners in the group mainly by the presence of dorsal tubercles and absence of discoidal folds, smooth belly skin, as well as the presence of supernumerary tubercles on hands. The call of the new species consists of seven ascending notes, the first of which has a dominant frequency of 2635 Hz and the last 3272 Hz. Molecular analysis of the 16S mtDNA indicates a genetic distance of 8% to P. chiastonotus, its closet relative, and between 9% and 11% to populations of P. fenestratus.